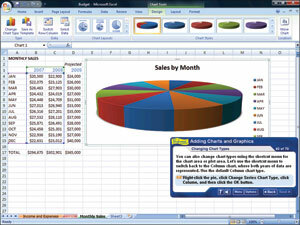 Professor Teaches Excel 2010 is a computer learning course designed to teach you how to use all the basic features and functions of Microsoft Excel. Professor Teaches provides you with hours of interactive lessons in a realistic simulation of the software. With our help, you will be creating professional looking spreadsheets and analyzing data in no time at all. 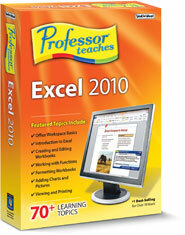 Download the product and start learning Microsoft Excel 2010 today! data & share information for critical business decisions! Introductions, summaries & end-of-chapter quiz questions all reinforce learning. What is Microsoft Excel 2010? 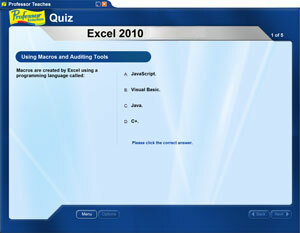 Excel 2010 is a spreadsheet management program developed by Microsoft. This version of the popular program allows you to analyze, manage, and share data in many ways. New analysis tools give you the ability to track data and highlight important trends. Excel 2010 makes it easy to share data and collaborate with others. What are the Benefits of Learning Microsoft Excel 2010?